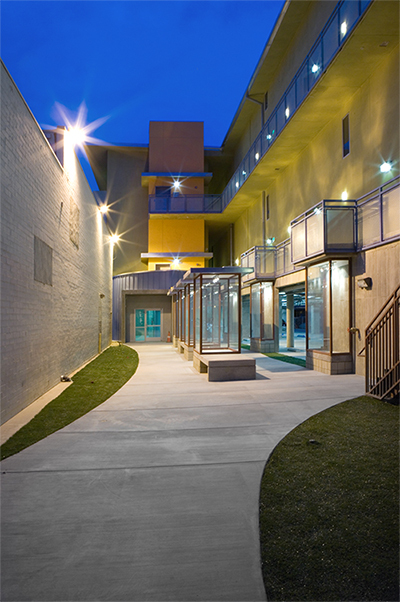 Arbor Artist Lofts is a 21-unit housing development in Lancaster, California that provides affordable housing for working artists. 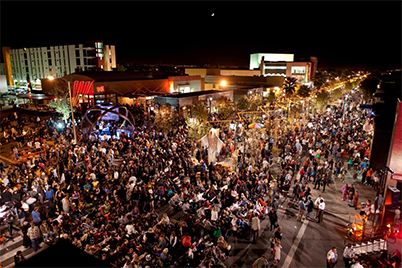 The project, part of the city's strategy to transform its struggling downtown into a regional hub for culture and the arts, received the 2010 American Institute of Architects (AIA)/HUD Secretary's Award for Creating Community Connection. Arbor Artist Lofts was a catalyst for the revitalization of downtown Lancaster, which earned a 2012 National Award for Smart Growth Achievement in the Overall Excellence category from the U.S. Environmental Protection Agency. 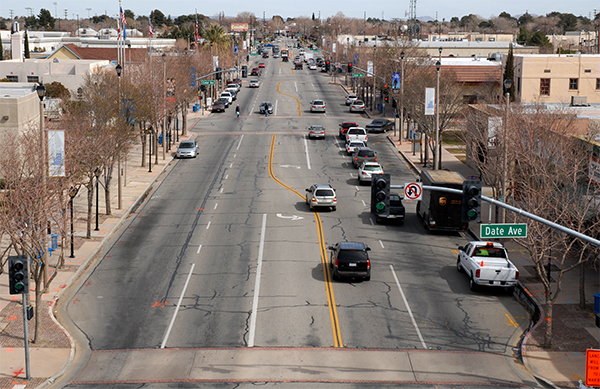 While Lancaster's population grew outward, the city's core slowly declined. Businesses along Lancaster Boulevard struggled to compete with suburban shopping centers, and by the early 2000s, empty storefronts were common in a business district that captured only 1.5 percent of citywide retail sales.3 The loss of a thriving main street district was felt not only by local businesses; many residents and city leaders yearned for the era when downtown was the community's social and cultural center. 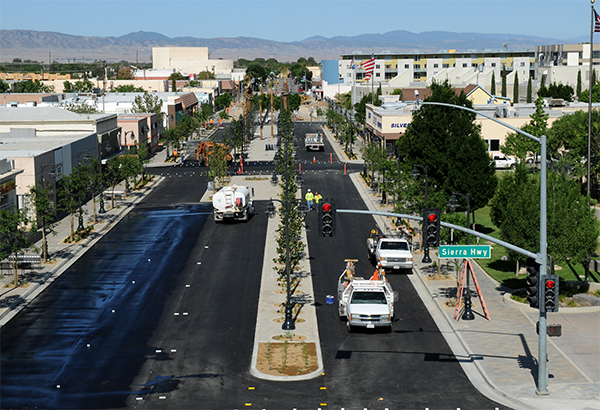 In 2006, the city initiated a detailed planning process for 140 acres in the downtown area.4 The resulting Downtown Lancaster Specific Plan, which the city adopted in 2008, promoted a walkable urban core for the Antelope Valley, where residents can live, work, play, and shop.5 At the heart of the plan was a form-based code that would regulate the design of buildings and public amenities. 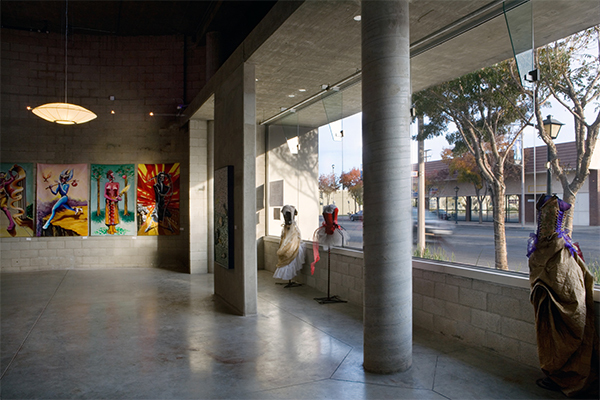 Arbor Artist Lofts is now a downtown landmark that provides live/work space for the resident artists. 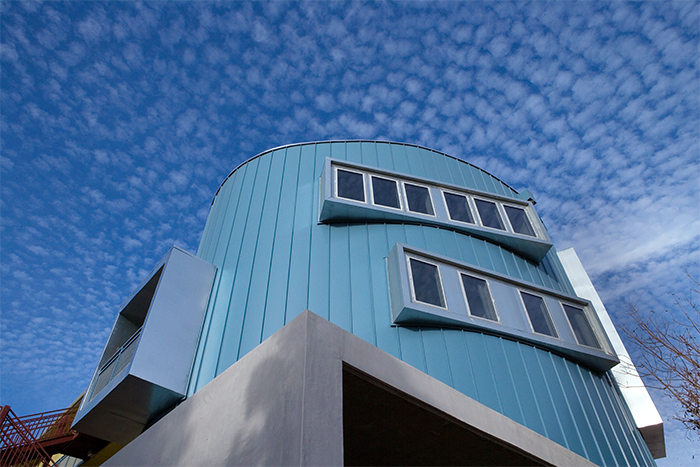 The façade of the five-story building is notable for its curvilinear form and blue metal cladding above a recessed commercial space on the ground floor.7 Beside this dramatic front massing is the entrance to a courtyard that serves as an outdoor art exhibition space and provides access to the residential units, which comprise the building's upper four floors. Covered parking is located behind the commercial space and beneath the second floor, largely hidden from street view. The two-story apartments were designed to meet the needs of working artists. Each unit is equipped with a 220-volt electrical outlet on its balcony for kilns and other equipment, and a workspace on the second story of the units includes an exhaust vent to expel noxious fumes. Polished concrete floors and steel stairs create a durable space that balance the unit's domestic and productive uses. The apartments on the building's second and third floors include an open volume rising through the two stories. This allows for a dynamic space that can accommodate two bedrooms on the first story in addition to two bedrooms on the second story. The units on the fourth and fifth floors have an open plan, with one bedroom off the main living space on the first story and three bedrooms upstairs. 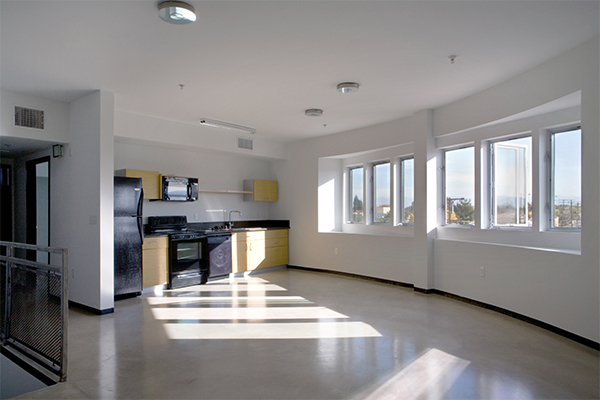 All units have a kitchen on the first floor and bathrooms on the first and second floors. The design incorporates sustainable features to reduce energy and water consumption. The building's high-efficiency mechanical systems exceed the requirements of Title 24 of the California Energy Code by 20 percent, and the lighting system exceeds these requirements by 24 percent. 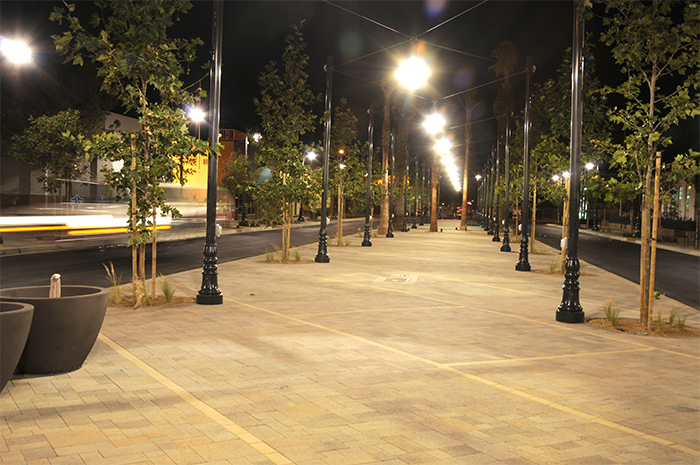 In addition, low-flow plumbing fixtures reduce water use by 20 percent, and the site is landscaped with drought-tolerant plants. *One unit is reserved for the building manager. Arbor Artist Lofts has proven critical to the revitalization of downtown Lancaster. 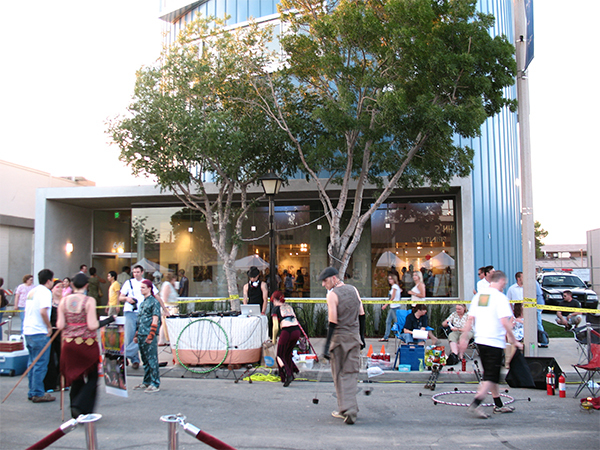 As one of the first infill projects completed in accordance with the downtown plan, Arbor Artist Lofts has attracted a diversity of residents to the city's core and has ensured the long-term viability of affordable housing for artists. City of Lancaster Planning Department. September 2008. “Downtown Lancaster Specific Plan, Appendix F: Historical Period Building Survey,” 5–9. Accessed 21 November 2012. City of Lancaster Planning Department. July 2009. “General Plan 2030: City of Lancaster,” 1-6. Accessed 21 November 2012; United States Census Bureau, 2011 Population Estimates Program: California. Washington, DC. Accessed 20 November 2012. Interview with Brian Ludicke, planning director, City of Lancaster Planning Department, 29 November 2012; City of Lancaster Redevelopment Agency. August 2006. 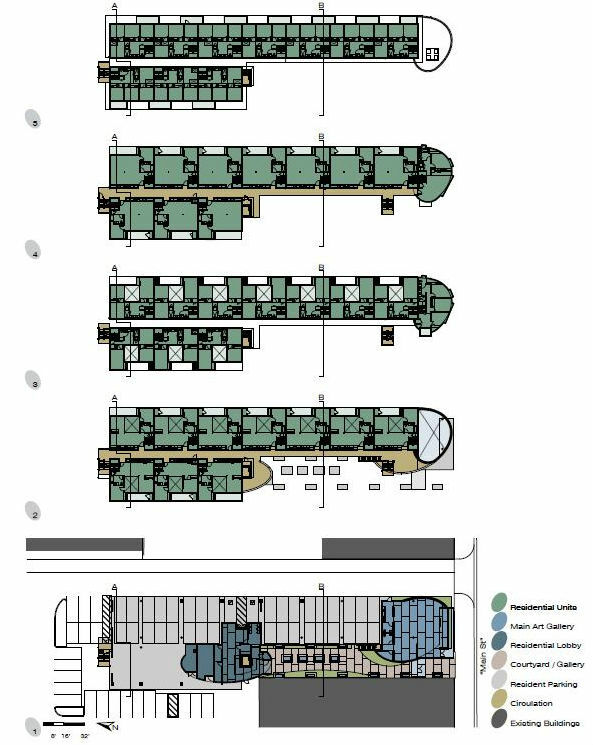 “Downtown Specific Plan Feasibility Analysis,” 8. Accessed 20 November 2012. City of Lancaster Planning Department. Downtown Lancaster Specific Plan, 1-1. Interview with Mark Lahmon, principal, PSL Architects, 28 November 2012; internal documents provided by PSL Architects. Email correspondence with Amanda Johnson, InSite Development, 28 November 2012. Internal award submission documents provided by Brian Ludicke, planning director, City of Lancaster Planning Department, 30 November 2012.